I do not care though as all the sweat was worth it as tonight I am leaving Rome. I have had enough of the heat and tourists! 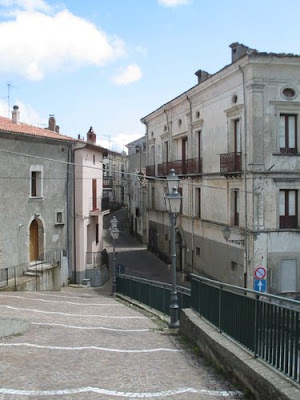 I am going to Calabria, to Malito - bel ragazzo's village. Only for the weekend mind you. Bel ragazzo is not even here, he went down to Sorrento yesterday for work so will be catching the train to his village this afternoon whilst I have the pleasure (note sarcasm) of going to Tiburtina train and bus station tonight at midnight to catch the bus down south. It is not that I don't like the bus - on the contrary I prefer to take the bus as compared to the train it is so much more relaxing. They give you a drink, often you can watch a dvd and since I am travelling through the night I will get there in about 5 or 6 hours. I love the bus. I just hate Tiburtina. If you read my comments in yesterdays post I said that the only time I have seen human feces is in this station - on the floor just out front of the supermarket. 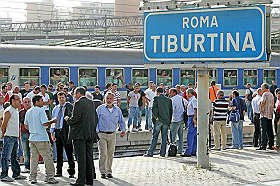 Tiburtina is the home (it seems) of every gypsy, drunk and homeless person in Rome. I'm not exaggerating here, Tiburtina is so disgusting but sadly for me unavoidable. Oh well...deep breathe as before I know it I will be in the peaceful, beautiful Calabria...Sunshine and seaside awaits! Thanks! It is so good to get away from the city, even if it is only for a short weekend. You have a good weekend too! I thought of your post as I rushed through stazione tiburtina yesterday morning... it is by far the nastiest of stations. Luckily I only have to deal with it by day, I can't even imagine by night! the little commuter train I take (the one that goes to fiumicino & back) was packed and guess what? air condition was off/broken in half of the cars. I can't begin to explain the stench inside. by the time i got to work i was totally sweaty & miserable. Poor you on those little trains. I used to take them when I lived near Trastevere last time I was here. It is just to horrible when you start the day sweaty and smelly and it has nothing to do with you...only the fault of the public transport! Hi!! That's exciting you are going to Calabria! :) of course the bus station at night is a bit sketchy! Hopefully everything will go smoothly fill us in on the Calabrese food!! CIao!! I am back from Calabria and it all went well..now back to life in hot and humid Rome! Tiburtina is definetely a get-in get-out station. No stops. Yes, it is a no stop station for sure! Shame the bus station is there though.